There’s something about brunch. For some it’s the brilliance of pancakes at breakfast, for others the excuse for a vodka filled Bloody Mary before midday. For me, it’s the joy of gathering a group of pals together for a much needed catch up and to post-mortem on the previous night's antics before planning future brunch clubs. 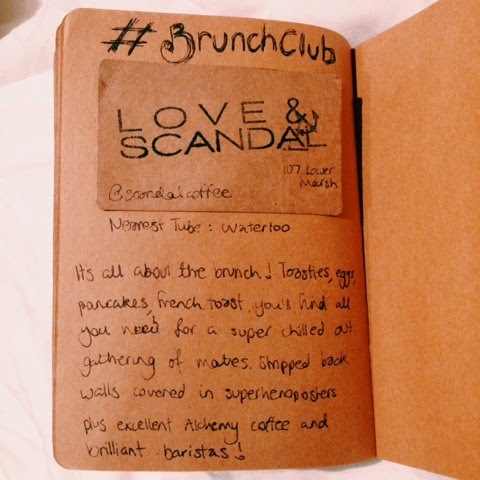 For episode one of #BrunchClub, 7 merry souls invaded Love & Scandal, tucked away behind Waterloo station on Lower Marsh and the perfect place to chill out while getting heavily involved with French Toast. The interior is stripped back and simple with white walls made excellent by multicoloured super hero posters and cartoon strips. The Alchemy coffee is expertly handled by the barristas who know what they’re doing and the new brunch menu is something else entirely. Having had a sneaky taste on my first trip to Love & Scandal of what would be to come, (yes, that was perhaps the best toastie I've ever consumed - hats off to chef toastie man), I had high hopes for #BrunchClub. After a minor amount of faffing around where decision making was concerned, the majority of the table opted for ‘The Scandal,’ a French Toast toastie containing Maple syrup soaked bacon and melted Gruyere cheese. Scandalous indeed! We headed back to our seats and eagerly awaited our food. The only annoying thing about brunch is by the time it arrives, stomachs are reaching rumble territory after having forgone breakfast in favour of future stuffing. Luckily, the wait was a short one and our Scandals appeared at the table. Fluffy, sweet and cheesy with perfectly egg soaked bread, this is an enviable choice. I’d have added a little jug of extra maple syrup on the side for an added note of indulgence, but it’s early stages for the guys at Love & Scandal (this was their second brunch serving since opening). Other offerings included eggs benedict and posh beans on toast, with last weeks menu also featuring pancakes (here's hoping they'll be back)! Flat whites in full flow, we gobbled up our brunch while making the odd trip back to the counter for more, where pastries, toasties, cakes and brownies are all on offer. The brownie was more chocolate than brownie and one piece between seven was quite enough given its richness although with a scoop of ice cream, it would make a pretty spectacular dessert. The staff at Love & Scandal are all delightful and were impressively understanding while we monopolised the entire back part of the room for 3.5 hours. Make sure you give a nod to the friendly dinosaur who I considered naming: female name - Chrysanthemum, male name - Archimedes .. turns out he's just called Dave. Unfortunately (or fortunately) for them, we are all a little bit in love with the place, vowing to make it a permanent spot for #BrunchClub and planning to return on a dangerously frequent basis. Perhaps it's the effortlessly relaxed atmosphere or maybe the genuine friendliness of the staff, but whatever the case, Love & Scandal is more than just a neighbourhood coffee spot and was a great sweetener to our Saturday. (Nod to Henry Fielding who wrote that 'love and scandal are the best sweeteners of tea' - I do love a place with a literary reference)! Open in the evenings as a bar, Love & Scandal have a great range of beer and cocktails too – see Matt The List’s post here for an idea of its past night time activities. I'm looking forward to the addition of Bloody Marys and am keeping my fingers crossed that something waffle related will feature on the menu soon. See you next week!